Although the original twelve Regions of the BSA were organized in 1921 they were not the “original” regions as they are commonly referred to. The original geographic division of the country by the BSA was done in 1913 by the National Council. There were originally eight regions although they were referred to as “Sections”. Each section was given a goal to raise $5,000 each year to pay a full time executive to further build the Scout movement in each of the eight sections. Each of the eight was named rather than numbered. Numbering took place when they were reorganized in 1921 into the “original” twelve Regions. 1. Eastern States Section – composed of the New England States, New York, Pennsylvania, New Jersey, Delaware, Maryland, District of Columbia and West Virginia. 2. Southeastern States Section – composed of Virginia,, North Carolina, South Carolina, Georgia, Florida, Tennessee, Alabama, Mississippi and Louisiana. 3. Middle West Section – composed of Ohio, Michigan, Wisconsin, Indiana, Illinois and Kentucky. 4. Northwest Section – composed of Minnesota, North Dakota, South Dakota, Nebraska and Iowa. 5. Southern Central States Section – composed of Missouri, Kansas, Oklahoma, Texas and Arkansas. 6. Mountain States Section – composed of Colorado, Wyoming, Utah, Arizona and New Mexico. 7. Southern Pacific States Section – composed of California and Nevada. 8. Northern Pacific States Section – composed of Washington, Oregon, Idaho and Montana. Above information referenced from the very early BSA Annual Reports. 1918 photo of the Middle West Section Conference held at Camp Miakonda in 1918. James Wilder, the first Chief Sea Scout, can be seen in the photo wearing a Sea Scout Skippers hat. Members of the Toledo Council's Tribe of Gimogash (honor organization) are in the front. They have a triangle patch on the front of their hats. Click on picture above to see larger image. A Middle West Section Scout Conference was held at Camp Miakonda in Toledo Ohio in April 1918. Over 200 Scouting officials from the six state area attended. Among them were National BSA officials such as James Wilder who was the first and only “Chief Sea Scout”. Within two months of Wilder’s visit, Sea Scouting was started in the Toledo Council at their 1918 Council summer encampment. After the 1918 conference and with James Wilder's encouragement Sea Scouting was started in the Toledo Council at their 1918 summer encampment. 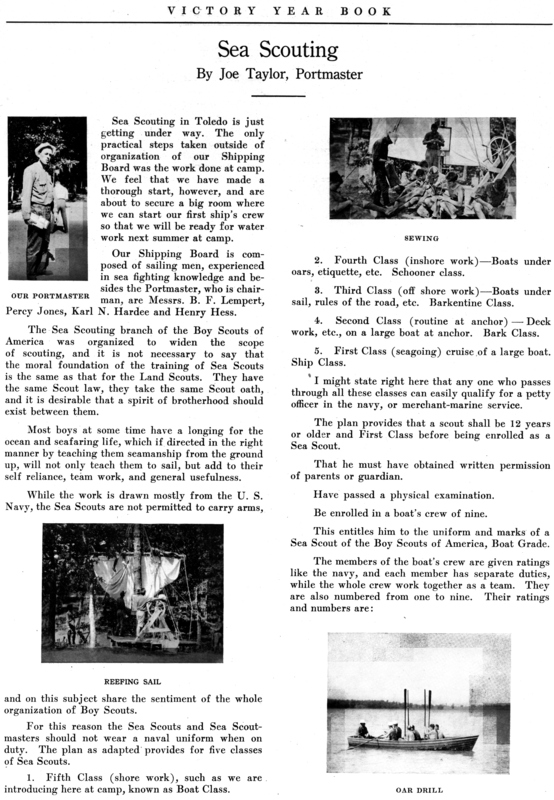 Attached is a photo of the Sea Scout training area at the camp in 1918 followed by a page from the Sea Scouting Victory Year Book.